Surrounded And Alone – Hi Blog! I'm Dad. We tend to do things when our peers do. From birth to retirement, many milestones throughout our lives just seem to match up. It may have more to do with timing than social pressure, but either way, there you are. For the most part, wedding bells and baby bottles all sort of burst on the scene in a big way all at once. It’s comforting in many ways to have babies when your friends do. Not only do you know that your children will grow up together, but you also can compare notes. Little Billy is crawling? That’s so funny. So is my kid! He’s eating solid foods? Us too! Look at us with our babies. We’re all terrific. It was that way when my daughter was born. Olivia was neck in neck with every kid in her age range and hit lots of her major moments early. Thankfully, we had many parents sharing the same boat with us so there was an abundance of praise, observations, and information about what it takes to raise a baby her age. It didn’t feel the same way for Lucas. My son, who today is non-verbal with Autism, was not neck in neck with those in his age range. In fact, he trailed in nearly every area. Sure, there were other parents with kids his age, but they weren’t in the same boat we were. Sometimes, I wondered if we even had a boat at all. It felt like we were treading water. There was little praise, nothing to observe, and none of the information available pertained to us. Many of the similarities that parents are able to share with other parents weren’t there. There may have been tons of people all around us, but we felt pretty alone. Soon enough, we had a diagnosis and our home was being filled with various professionals, teachers, and therapists. They observed Lucas and gave us tips to better work with him. While some would vaguely reference their own children, none of them had a boy just like ours. When they left at the end of his lesson, they went home. They didn’t obsess about how he would ever learn or what he would become. After all, they had dozens of other kids on their teaching schedule. His special needs were special just to him and his needs were ours alone to fulfill. The hour would end, the door would close, and we would all be alone together again. Eventually Lucas was accepted to a preschool for children with Autism. For years, we sent him on the bus with his tiny backpack and hoped he would have fun. Some teachers were fantastic. Some were not. Overall, though, it felt like where he was meant to be. His progress, while spotty at times, was still evident and, as he matured, so did his behavior. Then came the big graduation. While a much bigger story for another day, let’s just say it wasn’t what we expected. To show the adoring crowd how much every child had progressed throughout their time there, the school made the baffling decision to have each student, verbal or otherwise, come up one by one, accept their diploma, and reply with a “thank you” into the microphone. My wife and I sat in stunned confusion as each boy and girl took their turn on stage, accepted their certificate, and uttered a small “thank you” over the sound system to a barrage of roaring cheers. We had no prior knowledge that this would be happening and knowing that our son didn’t speak at all and was still figuring out the specifics of his communication iPad was like waiting for your teacher to come to your desk to grade a project you didn’t do. Every “thanks” was another three seconds closer to whatever was coming. Within the first five graduates, it became clear that they had lined the children out in order of how well they could communicate on stage. That said, my son was the absolute last kid out of dozens to go up. Not only that, but he couldn’t properly navigate his iPad to say “thank you”. When the aid who had been holding his squirming body in place for the duration of the ceremony finally pressed the button for him, the audience let out a round of pity applause. 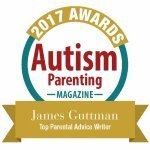 There I was – literally surrounded by an entire room of Autism parents. These weren’t professionals or parents to children not on the spectrum. These were our people. They were all around us. And I’ve never felt more alone than I did in that moment. My wife and I went through the rest of the festivities in a haze that I still get pulled back to whenever I remember that day. Sure, he’s improved in the two years since then, but his graduation stung much harder than we ever expected. Maybe because, unlike doctor’s visits and earlier pitfalls, this was supposed to be a day of happiness. It was supposed to be a day that we celebrated his progress. It was supposed to be a day where we felt anything but alone. Over time, I began to realize that maybe the reason I felt that way was because my outlook, like his school, had been too specific. It was always about obvious skills like how someone else’s four-year-old spoke while Lucas didn’t. It was never about how they both steal Cheese-Its from the pantry or lay on the floor boneless when it’s time for bed. I felt like our lives were so staggeringly different than everyone else’s because I was looking at the things that were different before looking at anything that wasn’t. If I didn’t focus so much on that, maybe our home wouldn’t feel like an island. Don’t get me wrong. That’s not an easy task and I’m not saying I’m always able to do it. We’re parents and whether your child is on the spectrum or not, you want them to be just as advanced, if not more, than the next kid. I want it for my daughter and I want it for my son. When you see an area lacking, it’s hard to look away and direct your attention elsewhere. The whole thing can be frustrating for a parent. It’s supposed to be. We’re parents. All children are unique. My son is no different. Even if he didn’t have Autism and talked up a storm, he would still never be completely the same as another child. Yet, we all have things in common. What separates us might appear more prominent, but that doesn’t mean that’s all there is. There’s a piece of all of us in each other’s stories. We just need to find what it is. And if you do that, you never have to feel alone.